This routine is a full body workout and contains exercises designed to increase strength, power, stability and also some muscle hypertrophy (muscle building). It covers all the major muscles that will help you in your golf swing, legs, glutes, low back, upper back, shoulders and core. These muscles will help give you a strong, stable base to make a powerful swing from and some serious distance! The weight for each exercise should be moderately heavy and so that reaching the required reps is a challenge, when you can perform the required number of reps you should add weight and build back up again. between each exercise take 60 – 90 seconds rest depending on how hard you found the previous set. This workout can be performed every other day for as long as you are making progress or it can be added to your workout schedule with other training sessions. Holding a dumbbell in both hands and against your chest for support, push your hips back and squat down until your knees reach at least a 90 degree angle. Try to keep your chest up and torso as upright as possible. From the bottom of the movement, push explosively from the middle of your foot. 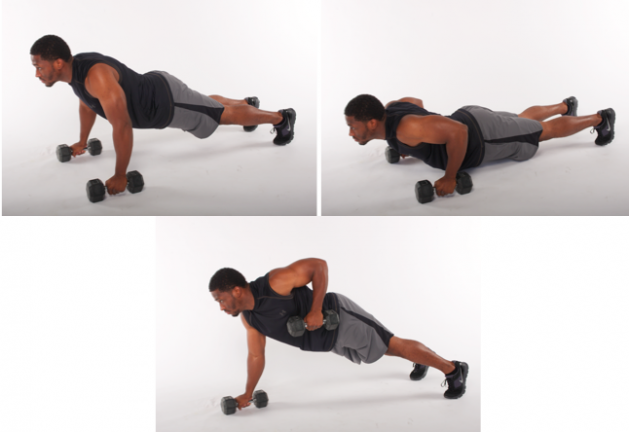 In push-up position, resting on Dumbbells, perform a push up then immediately row one of the Dumbbells to your chest and then the other. 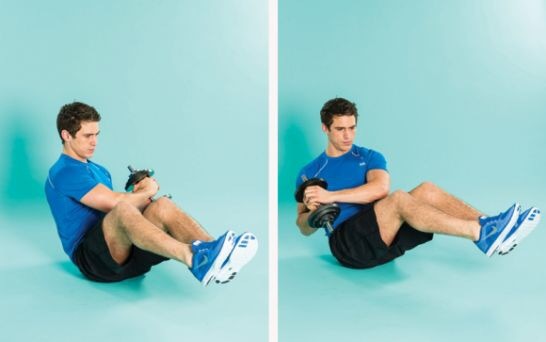 Make sure to keep your core braced at all times and perform the rows in a controlled, smooth movement. 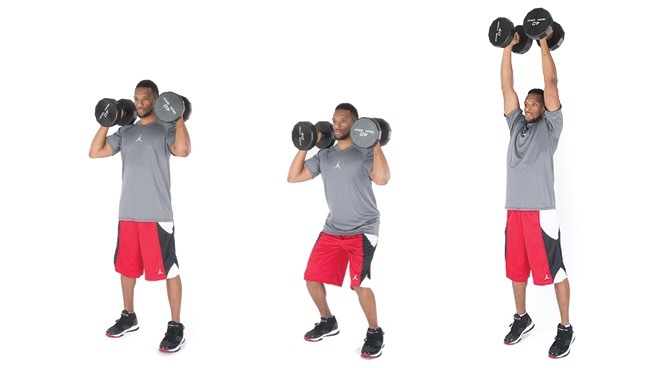 Holding both Dumbbells at your shoulders, perform a half squat and then explosively push through the middle of your feet in a jumping movement and press the weights overhead in one motion. Slowly lower the weights and repeat. Holding both Dumbbells in your hands and with one leg bent slightly in the air, bend slowly from the hips with straight arms and making sure to keep your back as straight as possible, when you feel a nice stretch down the back of your legs slowly extend back to the start position, squeezing your glutes all the way. Bend over as close to parallel to the floor as possible, if you have a chair that you can rest your chest on at this angle then that’s a great tool, if not its not essential. In order to fully stimulate the rear delt you have to have the opposite of ‘good’ posture, allow your shoulders to roll forwards and your shoulder blades to separate. From this position you simply raise your straight arms to your sides until they are parallel to the ground. The weight you will need for this is to be fairly light as going heavy Puts you at risk of injury. Holding Dumbbells in each hand at your side, take a large step forward with one leg and drop down into a lunge, push back up with both legs then switch legs and repeat for 15 reps each leg. Laying on your back and holding a dumbbell in both arms I front of your chest, sit up and raise your legs. When in this ‘contracted’ position, twist your torso and the dumbbell to the left and then all the way round to the right. Repeat this for 15 reps each side. The you have it, a full body workout to get you strong, stable and bombing those drives! This workout works really well when combined with my Plyometric Power Home Workout which you can get absolutely FREE here when you sign up for my newsletter which gives you exclusive free workouts, exercises and tips straight to your inbox! Check out my other posts here on great golf exercises, workouts and tips. Make sure to like my page on facebook and follow on twitter and instagram, all linked at the bottom of the page and to the side. Subscribe to my mailing list to get great golf exercises, workouts, tips and motivation directly to your inbox! Also when you subscribe, I kick things off with a completely FREE Plyometric Power Home Workout pdf for you to make some swing speed gains with straight away! Click here to subscribe and get ripping those drives! Golfer and gym goer. I enjoy helping people achieve their golfing goals by providing exercises and workouts to improve performance and giving people insights into my own golf training. Next Next post: Golf fitness – Crank Up Your Swing Speed Right Now With These 3 Exercises!